Dr. Alison Sweeny describes her work caring for female Veterans as a VA clinical psychologist. Clinical psychologist Dr. Alison Sweeny chose a mental healthcare career at the U.S. Department of Veterans Affairs (VA) for the mission and to deliver integrated care, which puts Veterans at the center of a coordinated care team. Sweeny practices clinical psychology at the Michael E. DeBakey VA Medical Center Women’s Health Center in Houston. Colleagues invite Sweeny and other specialists to appointments with female Veterans to provide familiarity and comfort in case the patient needs additional services in the future. VA pioneered the use of patient-aligned care teams (PACTs) to help deliver care that’s convenient, cost effective and best helps women Veterans attain optimal levels of health and well-being. “I’m in and out of the offices of our PACT team members all day long and able to really kind of collaborate, not only to provide care for the Veteran but also to support each other in the work that we do,” Sweeny said. Sweeny and the psychology team at the Women’s Health Center are trained to address specific health issues that may affect women Veterans, like military sexual trauma, deployment-related issues, depression and high blood pressure, according to VA’s Women Veterans Health Care program. Trained in women Veterans’ mental health issues, Sweeny regular interacts with other PACT team members, which include primary care physicians, nurse practitioners, nurse case managers, medical assistants and administrative staff. The support clinicians provide to each other is a welcome and added benefit of being a team member. El-Serag’s work as PACT team leader and dedication to female Veteran care inspired Sweeny in her VA career choice. Sweeny chose VA to practice integrated mental health care with a team of colleagues dedicated to women Veteran’s health. See if a VA career as a mental health professional is the right choice for you too. 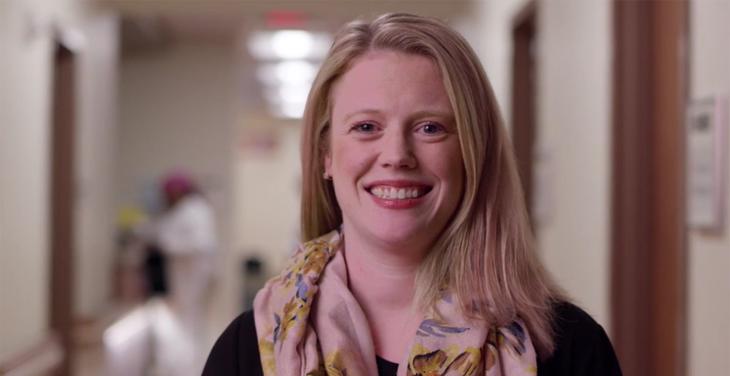 WATCH Dr. Sweeny describe why she chose VA for her healthcare career (see PACT Team, V1-3). READ more about VA services for women Veterans. EXPLORE a VA career in mental health. Learn about Veteran and nurse Luis. Discover Veteran and nurse Leola. Find out about Dr. Anna. Get to know Dr. Patrick. Learn about health communicator Blake. Get to know Dr. Chaison.